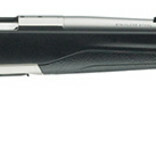 BROWNING X-BOLT 375H+H SS/SYN 24'' LA - Corlane Sporting Goods Ltd. This attractive and weather-resistant bolt action rifle is similar to the X-Bolt Composite model, except for a stainless steel receiver, barrel and bolt. It has a comfortable palm swell for right-hand shooters, textured gripping surfaces for keeping your hands where they should be on the stock, even in wet and cold conditions. This model also features a deluxe Inflex Technology recoil pad, open sights and sling swivels.